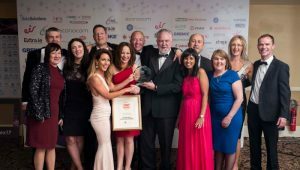 On Thursday 18th May, St. Vincent’s University Hospital (SVUH) won the prestigious national IT Professional Team of the Year Award at the annual Tech Excellence Awards which were held at the City West Hotel in Dublin. The hospital’s award winning Whiteboard Solution Project is an innovative use of healthcare technology which has resulted in system wide improvements to overall patient flow within SVUH. SVUH is the only acute level 4 hospital within the Republic of Ireland to have a fully integrated Whiteboard technology system available across every ward within the hospital. The technology is the most advanced of its kind in operation with fully fledged functionality which allows for touch screen management of patients by clinical staff on wards. SVUH is a clinically led hospital. The ICT Medical Executive and senior management within the hospital proposed and supported this project from inception after identifying the need for a smart technology solution to improve and enhance patient flow across the organisation. The hospital has a substantial amount of beds across medical and surgical wards in addition to an emergency department, intensive care unit, acute medical assessment unit, and acute medical unit and theatre beds. In most public hospitals the scheduling and discharging of patients transferring into and out of a bed is very labour intensive and reliant on paper diaries, phone calls, physical whiteboards and daily bed allocation and discharge meetings between nursing and bed management staff. SVUH required a bed management and ‘productive ward’ combined electronic system to replace the physical ‘dry wipe’ whiteboard with intelligent touchscreen technology. The integrated ‘one touch’ Whiteboards allow staff to update patient data on the board with clinical icon indicators and symbols that provides ‘patient status at a glance’. The system also needed to integrate with the Emergency Department (ED) clinical system and Patient Administration System (PAS) in order to streamline processes, maximise bed stock and gain greater visibility on ED patients requiring an inpatient bed. “Excellence in patient care is embedded in the core values of the hospital and how it meets the needs of its patients. The management of the patient journey from admission to discharge plays an intrinsic part in meeting those needs. “I am delighted that SVUH and our IT Department have been recognised by the Tech Excellence Awards adjudication panel for our dedicated and innovative approach to all our work including the implementation of the recent Whiteboard technology”. To improve communication between multidisciplinary teams (MDTs) on patient admission and discharge status and internal referrals to Allied Health Professional (AHPs) teams. Availability of user friendly touch screen white boards which made the transition from physical whiteboards to touch screen white boards a success. SVUH, Computer Sciences Corporation (CSC), Servelec and Sean Doyle (freelancer) successfully delivered the integrated patient flow solution within SVUH and the hospital acknowledges the support and advice received from the HSE ICT Department in approving and funding this project. This project would not have been successful without the support of the HSE.